This is my trying-not-to-be-annoying pic of Thurston Moore from Sxsw this year. He had come into the club where the Kill Rock Stars Showcase was, and a little star struck, I snapped this awful picture. In tandem with tickets for Sonic Youth going on sale here in my area (Dallas & Austin fans buy here, not thru ticketbastard), here are a couple of new tunes from a forthcoming Thurston solo album which will be out on Thurston’s label Ecstatic Peace on September 18. It’s mostly acoustic material and includes friends J Mascis, Christina Carter (of the Charlambides), Steve Shelley(SY drummer), & Samara Lubelski(violinist). A 4LP edition will be out on July 10th. Jana Hunter‘s new cd There’s No Home has been in constant rotation since about a week ago. I caught both of her shows here on Monday and recorded the acoustic show at Good Records. The videos didn’t come out great, because of the mood lighting, but there were at least 3 other people who shot some video (including GvB), so maybe their’s turned out better. At any rate, both shows were excellent, in the tops for the year, and her cd is already in my top picks for ’07. I’ll probably drive to Austin to catch her open for Devendra in October. Baltimore is a very lucky town. I took for granted she’d always be around. The other night (Friday?) in Tucson a bunch of gear was stolen from the van of Jana Hunter & Castanets. “So, the story is, last night we played in tucson at solar culture. on the order of 2 grand to replace the door. ray and i asking with very kind words of sympathy and offers of help. paypal accounts so that we can avoid paying fees on the donations. plan to pass on whatever is left over to a charity or charities. Tonight, I get to see Jana play at Good Records @ 6:30pm and later at Rubber Gloves Rehearsal Studio. In Austin & Houston, she’ll be playing with Pink Nasty (who was in the pews at Jana’s Sxsw show), and next month she’s opening for Rasputina. I think this may be my last time to see her before she moves away. I’ll hope she feels the inexplicable magnetic pull of this state and visits us often. 2 Great Live in-studio performances for Planet Claire. Keep your eye out for other bands stolen stuff at StolenGear.org. Miranda July (Me and You and Everyone We Know filmmaker) has 3 handmade posters that are up for auction on Ebay. There’s an apology, congratulations, and this invitation. People seem to like the apology (now at $730). I like the invitation (at $315). These are on auction for McSweeney’s. They lost over $100,000 because their distributor filed for bankruptcy (the story). If you’ve got $2000, you can get a personal tour of The Daily Show. Here’s the full auction list. Hurry…they start ending today at 12:17PDT. For their sale, the subscriptions are $5 off, new books are 30% off, and the real deal…half of back issues. Go to their store and lend a hand. Sorry the Bowie’s gone…maybe a little Nirvana will help? Few artists have been as influential, innovative, or ever-lasting as David Bowie. If you’ve got a hole in your Bowie Catalog, perhaps you can fill it here. There are nearly 40 albums for your enjoyment. I’m sorry it’s been so long, but for your patience and loyalty here you go. 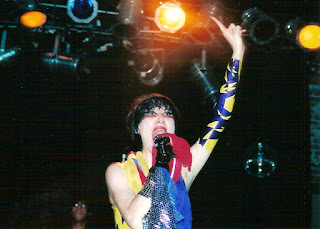 Get your Yeah Yeah Yeahs here first! First it was Karen O. Now, a song from the forthcoming Ep titled Isis. The 5 song ep was previously reported to be named Runt of the Litter, but this is no runt my friends.